I’ve gotta be honest, Kindred Sinks are quality through and through. Quality doesn’t come cheap, however. A double-sided, stainless steel Kindred sink will set you back $400 – $500. Fortunately, if you’re in the market for one, you can find them much cheaper. Check out the auction sales below on Kindred Sink Products. If you’re still undecided, you can scroll down below the auction sales and read about my own personal experience with my Kindred at home. The sink pictured above is the very same one that I own. Small side on the right for washing dishes and disposing of food. Big sink on the left for rinsing and drying dishes. Careful…Sounds like a good concept, but in reality washing dishes this way a pain in the freaking rear! With dirty pots and pans, you will always want to use the side with the garbage disposal first in order to discard food and particles from the pots. With big pots and pans, this is a nuisance. The small sink-side is just too dang small. I am constantly spilling water, soap and dirty onto the counter top. This is a bad, bad idea. I have nothing against Kindred. I don’t believe they are even the company that came up with this foolish design. The previous owner of my home for some strange reason, thought this was a good idea – like the expensive Arwa faucet that leaked and took me weeks to find replacement parts for using a a creative Google Search query. Complaints aside, the material and workmanship of the Kindred brand are outstanding. I wouldn’t hesitate to buy another one, but not until I have the right side of my counter top carved out to match the side of the left. Two big sink sides are better than two small; or a small and a big one. Don’t go for this crazy design pictured, here. Get an equally large sink space for both sides! If you do your shopping online, you will get a good sink at a price better than what you’ll pay at your local hardware store. My only advice is to stay away from model # C2233/95K/4! Not all Kindred Sinks are the same. I am having a hard time understanding why you think one side is tiny..I have this sink only in the 18 gauge which is heavier and more durable than this 20 gauge….the faucet is moved to the right so that you can have an extra 2 inches of depth on the left. The right side is a normal standard size. They simply give you the bigger size on the left by moving the faucet over. If the faucet was in the middle like 99% of the sinks out there then it would be the standard size on both sides. This way you get a bonus of 2 inches on the left. It’s a fantasic idea for anyone who has extra large stock pots and skillets to wash. In order to have both sides the same as the left, you wouldn’t have anyplace to put the faucet! It’s a high quality well made sink and I got the 18 gauge for $221 with no tax and no shipping from Home Perfect. This sink is HUGE, and DEEP, and a great deal! Thanks for your input, Susan. I’m quite sure the side where the disposal lies, is smaller than the standard sink for washing dishes. However, I’ve learned a valuable lesson. Sometimes you just have to get used to a different way of doing things. A couple of weeks ago, my wife and I bought a nice rubbermaid, Sink Rack at Walmart. We keep the big-side free of clutter and use it to wash dishes. The small side is for washing off food so it goes down the disposal. It’s that simple. Also, we bought the new Hansgrohe, Gooseneck faucet and sprayer which works really well with the whole set-up! I ordered a T2421 Topmount Single Bowl Stainless Steel Sink for my new laundry room. The sink is large and deep and very good quality. I really like the drain rack I ordered with the sink too; I’ve never used on of these before and wasn’t sure I’d like it, but I’ve found it to be very convenient to have. The best sink I ever had was a Mr. Direct sink. Stainless steel has long been used in kitchen environments for its clean look and durability. The type 304 steel used in our sinks has 18/10 chromium/nickel content. 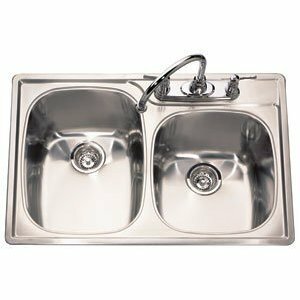 This makes the steel “stainless” and is the highest quality steel used in kitchen sinks. The brushed finish of our sinks is preferred over our competitors for its ability to hide small scratches than can occur over time. They’re pretty sweet!